Did you know that you can eliminate body odor from the inside out? One of the latest wellness and nutrition trends is a mean green tonic that not only deodorizes, but detoxifies and protects as well. I’m talking about chlorophyll people! Now a days you’ll find chlorophyll tonics and infused waters in juice bars and even on the shelves of Whole Foods. So what exactly is chlorophyll and why are people going nutso over it? Let’s discuss y’all. Chlorophyll is the pigment that gives plants their green color, and it also helps plants turn light into energy. You’ll find that raw veggies like spinach and wheat grass are abundant in chlorophyll, so now you know of an additional nutrient you’ll be getting next time you make your morning smoothie! 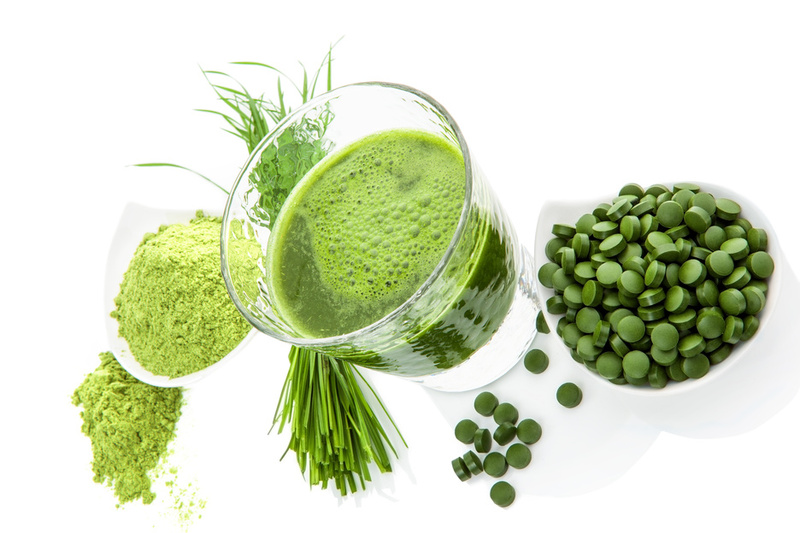 Why are so many people turning to chlorophyll supplements? What are the benefits of chlorophyll? As I’ve mentioned in some of my Instagram stories, I’m a huge fan of liquid supplements over tablet form. One reason being that liquid supplements are more easily absorbed into our system than pill form. With this in mind, liquid chlorophyll is making it’s way to the top of the latest and greatest in wellness trends because of all it’s nutritional benefits. Because our vegetables loose nutrients when cooked, liquid chlorophyll added to our beverages and tonics gives us the extra boost that we need when we aren’t feeling well or when we simply want to ensure that we are getting incredible nutrients in our system throughout the day. Read on to see the specific potential health benefits of chlorophyll. Deodorizes: Believe it or not, chlorophyll can actually deodorize body odor from the inside out. Who knew?! So if you’re concerned that you may have a foul mouth (and not just from swearing), add some chlorophyll to your next glass of lemon water and clean that dirty mouth. Detoxifies: Sources believe that chlorophyll helps us detoxify by flushing out heavy metals from our system by binding to these chemicals and preventing them from being assimilated into our intestines. Here’s a study discussing how it can also do the same with carcinogens that can cause cancer. Energizes: The 2pm slump can be such a b*tch, but it doesn’t have to with a little squirt of chlorophyll. Many nutritionists and wellness coaches believe that adding chlorophyll to your day will give you a natural energy boost, although I can’t find any clinical studies to confirm this. Could it be a placebo effect? Possibly, but if it will give you an extra pep in your step and it has other health benefits why not give it a go. Protects: This plant pigment is also tied to acting as a potent antioxidant. Some studies show that chlorophyll supplementation protects us from oxidative damage from chemicals. The antioxidant properties of chlorophyll can also protect us from signs of aging. It may also protect our skin because of it’s antiviral effects. Controls cravings: This study discusses that supplementation of compounds from chlorophyll may help suppress subject’s appetites and control food cravings. Aids digestion: Some experts also believe that chlorophyll helps us maintain healthy gut bacteria, and that it also alleviates gas and constipation. So if you’re feeling a little bit backed up, this may help. Boosts immunity: Chlorophyll may help carry more oxygen throughout our body which not only gives us more energy but also helps us fight off any illness that may come our way. It is also very alkalizing which also provides a healthy basis for our allover wellness. Eat more raw veggies like spinach, arugula, wheat grass, and parsley. But be sure to eat these raw as chlorophyll content decreases when these veggies are cooked. Liquid chlorophyll – you can find numerous brands that now offer liquid chlorophyll supplements, but make sure to always do your research before you purchase a supplement. As always, pregnant or nursing women should not use chlorophyll due to lack of safety evidence for pregnancy. It’s always curcial to consult your physician before adding any new supplements or foods into your diet. Balance Your Body With Salt; Pink Salt. Oil Pulling: Myth or Miracle?